An herb garden is one of the easiest and most rewarding types of gardens you can grow. Years ago in my first house in Phoenix, I grew basil plants so large they were, in reality, bushes. Cilantro, oregano, lavender, and varieties of basil that turned my front courtyard into a fragrant oasis — I loved it! After learning to grow some or all of their own food, many preppers turn their attention to other useful plants like medicinal herbs. Once established, herbs can be a relatively low fuss, but deciding what herbs to grow and where to plant them can be a bit overwhelming. 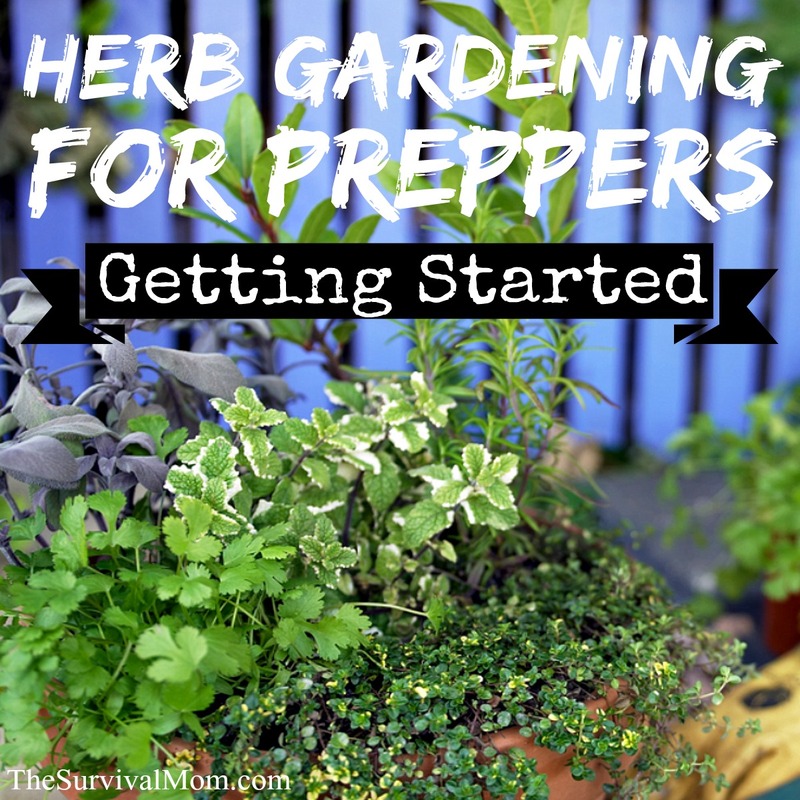 Herb gardening for preppers takes some planning but will be very rewarding. Because gardening depends so much on the local environment, it’s important to take your location into consideration when you are thinking of establishing an herb garden with prepping in mind. Rather than try to highlight a few plants that might grow well in one part of the country but never make it in another garden, let’s take a look at how to determine what will work well in a given situation- even if you don’t have much space or very little gardening experience. The first step is to decide on what you want to grow. This may take a good deal of research if you are new to herbalism, or you may already have a list in mind. If you aren’t sure what herbs you might want to grow, a basic guide like Making Plant Medicine by Richo Cech, my book, The Independent Herbalist, or another resource that gives information about specific herbs and how to use them can be a good place to start. Some of the most versatile and adaptable herbs that you may want to look into for your area include yarrow, peppermint, elder, hawthorn, valerian, and lemon balm, but again- they may or may not be well suited for your area. Once you have some herbs in mind, identify your garden zone. Most herbs are very hardy and grow across a wide range of temperatures and rainfall zones. Adding drainage in very wet areas can make a garden more successful, and very dry areas can use ideas like drip irrigation to concentrate water use. Knowing your zone and annual rainfall will help you when you begin to research the specific herbs you have in mind. Another good thing to learn about at this stage is native plants local to your area that are also herbs. Incorporating native plants into your landscaping means you will be working with herbs that are adapted to your local environment. Field guides like Medicinal Plants of the Pacific West by Michael Moore and Peterson Field Guide to Medicinal Plants and Herbs of Eastern and Central North America by Steven Foster and James A. Duke are a good place to start for this type of information. Once you have assembled a list of plants that you think will work for your area and determined your garden zone and annual rainfall, it’s time to look at what else the plants on your list will need to survive. Do a little research and make notes on your list about how much sun each herb will need. Some herbs need full sun, but others do better in part shade. Soil type and water requirements are other important things to note. Once you have that basic information, you can begin matching herbs to areas in your garden. It’s possible that most or all your herb selections can be planted in the same area, but let your herbs tell you where they are most happy. Don’t be surprised if you have a few growing in the shade, a few in full sun, a few pots on a patio that gets filtered light, etc. Make a sketch of your garden or yard and make notes about what should work well in the different areas. It’s also a good time to strike through any herbs that are obviously not a match for your garden- a plant that needs sandy soil will not be happy in heavy clay. Although the soil can be changed by adding amendments and conditioning, it can be a daunting process. In The Medicinal Herb Grower, Richo Cech suggests around ten feet of bed space per type of herb, or a minimum of three of a kind for home medicinal use. I’ve found that to be more than enough in most cases. In my experience, one plant of most species will produce at least enough herbal material for one 4 oz bottle of tincture. That’s a good size for a home apothecary, (most store-bought extracts come in a 1 or 2 oz size) so planting beyond that will give you material left over to dry and store for teas or other uses. While your herbs are growing, being collecting dark amber or blue bottles for tinctures and old prescription bottles for dried herbs. It’s important to note that plants in the mint family like lemon balm and peppermint will yield far more than you will ever need from one plant, and that large plants like hawthorn and elder will give a high yield from one plant, too. Short on space? No worries! Even though it’s great to have a full-sized garden, plenty of herbs grow well in containers. A small patio can supplement an apothecary stocked with dried herbs bought in bulk, and allow you to keep a selection of herbs at the ready if you ever have the opportunity- or the need- to establish a larger garden. Some kitchen herbs, like basil and oregano, can even be grown indoors in a sunny windowsill. Surprisingly, many kitchen herbs have lots of uses beyond seasonings. So even if you only have room for a few of these versatile herbs you will still be growing some excellent home remedies, too. 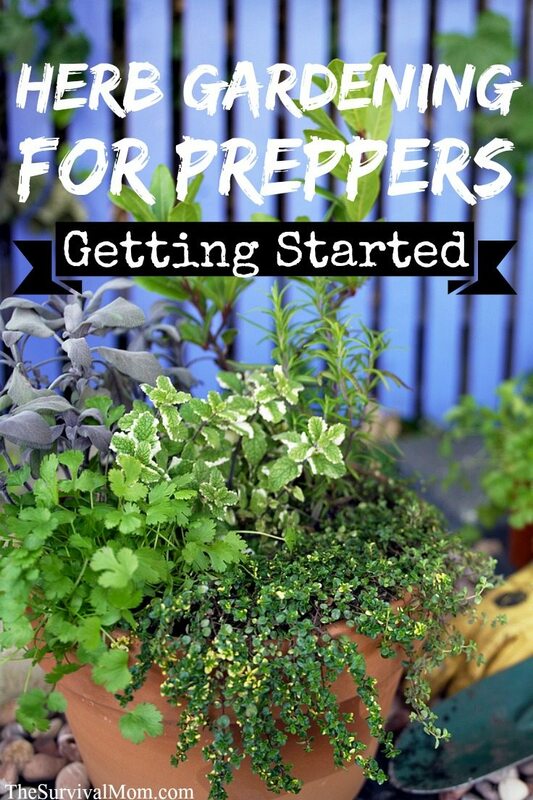 Whether you are growing a large herb garden or a small patio container garden, growing herbs as a prepper is all about determining what you want and what will work for your part of the country, but that’s the hard part! Herbs don’t need much care from us, so once they are established they basically look after themselves. Because they have such strong tastes, they are fairly pest resistant; and other than requiring regular weeding and an eye on watering if it gets too dry they don’t need much care. Good luck with your gardening endeavors!